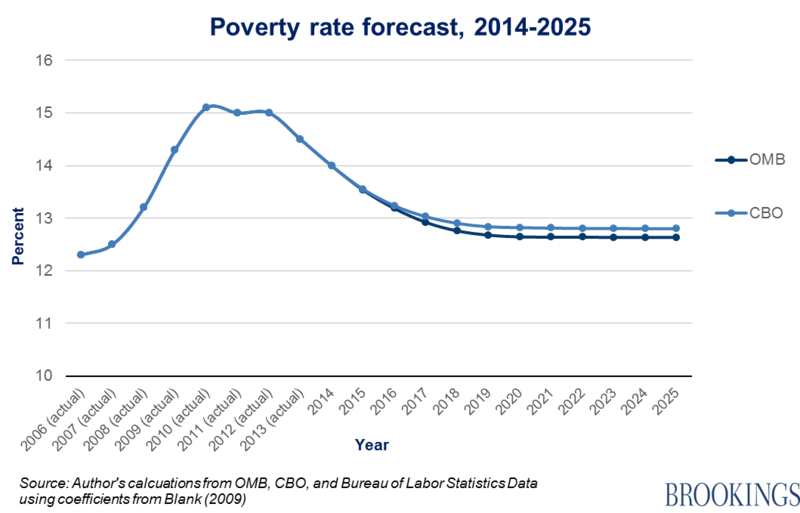 This week sees the release of the poverty figures for 2014 from the Census Bureau. Given the weakness of the labor market, we expect only a modest drop in the number of poor Americans. As a corollary, we believe any premature tightening of monetary policy related to unwarranted fears of inflation would be especially damaging to the poor. Paid work is the most significant source of income for the vast majority of Americans, and especially for those on the bottom rungs on the socioeconomic ladder. Scholars consistently find that the main driver of changes in the poverty figures is the unemployment rate. Among families with a full-time worker the poverty rate is around 4 percent. Approximately 45 million people—14.5 percent of the population—lived in poverty in 2013. What will the figures look like for 2014 and beyond? Since the unemployment rate decreased by 1.2 percentage points between 2013 and 2014, our forecasting model suggests a modest decline in the poverty rate for 2014. Specifically, our prediction for the poverty rate in 2014 is 14 percent for all persons and 18 percent for children. Compared to 2013, this represents an overall decline of about half-a-percentage point and a steeper two-percentage point decline for children since 2013. We also predict further drops thereafter, as the jobless rate continues on a downward trend towards the 5 percent level forecast by both CBO and OMB (in the absence of a new downturn). But we do not expect a return to pre-recession levels for a long time. With the U.S. unemployment rate at a seven-year low in August of 2015, the economy may be at a turning point. But this good news masks some more disturbing facts. As the CBO has noted, there is still considerable slack in the labor market. The long-term unemployment rate (those out of work for 27 weeks or more) has remained high, and so has the share of those working part-time but involuntarily. Many workers have become discouraged and dropped out of the labor market all together with the result that actual labor force participation is still well below its potential. In 2014, for example, there were almost 5 million people who were not working but who would have been employed if the both the unemployment rate and the labor force participation rate had been at normal, full-employment levels. With Congress engaged in an appropriations battle under the threat of a new government shutdown, it’s hard to be optimistic that anti-poverty programs will fare well or that fiscal policy will add new impetus to the economy. Monetary policy is the only game in town. Janet Yellen and her colleagues face a difficult choice between their desire to avoid an overheated economy and the need to keep the recovery going. Yellen knows, too, that any continuing slack in the job market is bad for everyone—but above all for the poor.